In answer to a question about a race of extraterrestrials called “Reptilians” being the real power group on the planet, the Hidden Hand claimed: “We are most certainly NOT Reptilian, and there is nothing remotely reptilian about the True Power Bloodlines.” This is an important admission by the Hidden Hand. While the most powerful elements of the Family are extraterrestrials, the Reptilian species has nothing to do with the real power behind the Family. This is contrary to what authors such as David Icke have been claiming that our world is secretly controlled by Reptilian entities. What the Hidden Hand is suggesting instead is that there is a Luciferian group soul that is working in our Galaxy that has established power not only on our planet, but on other worlds. Reptilian worlds under the influence of the Family, or Luciferian entity, would be as highly manipulated as our own by off-world bloodlines. In other words, just as the Family has historically manipulated nations of our world into countless wars that increase the power of the Family, so too the Family has played a similar role in fomenting galactic wars. 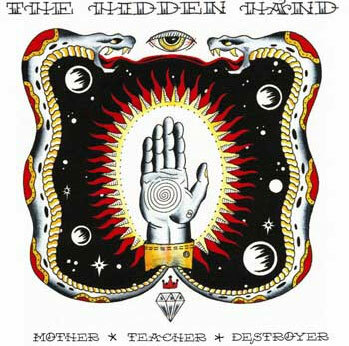 In short, the Hidden Hand has not only revealed the secret power structure that manipulates life on our planet, but also the power structure that dominates many planets in our galaxy and beyond. San Francisco and Damascus, will be uninhabitable by the end of 2010, possibly even soonerâ€¦ There will be raging tsunamis and widespread devastation; and a solar emission in late 2009 early 2010 that will cause major melting of the ice caps, and subsequent drastic rise in sea levels, leaving many (international) metropolitan areas underwater. These failed predictions suggest that, even if genuine, the Hidden Hand and the Family are not infallible when it comes to predicting and/or controlling world events. In terms of philosophy, the Hidden Hand dialogue is very consistent with the RA material which is the most widely cited set of channeled materials on the planet. The RA material (1981-1984) was the first to introduce concepts such as negative and positive polarities, densities, a Harvest around 2012, and social memory complexes that are repeatedly cited by the Hidden Hand. The RA material also revealed that it was possible for a group of entities to spiritually evolve through densities by negative activities. This idea is unique to the RA material, and appears counter intuitive at first, but has a solid philosophical background to it. In terms of agenda, the Hidden Hand says that s/he has been instructed to participate in revealing the truth of Earth’s hidden rulers since this is a requirement for the upcoming “Harvest.” In the Harvest, all individuals are tested for their core ethical orientation for whether they evolve or not out of our third density existence, into a more refined fourth density. The End of the Mayan Calendar (approximately December 2012) is claimed to be when the Harvest occurs. Individuals then get to decide what is most important in their lives – the polarities of “service to self” or “service to other”. Those in the middle, who haven’t yet chosen a polarity, are at real risk during the Harvest according to the Hidden Hand and also in the RA material. The agenda behind the Hidden Hand’s revelation therefore appears to be very plausible given what has been described in the RA material. Most importantly, the agenda may not be exclusive to Earth, but also applies to extraterrestrial worlds where “The Family” has great influence. So what can one conclude from the Hidden Hand dialogue? In my opinion, it is a genuine revelation by an insider belonging to an organization called “The Family” that has both Earthly human and extraterrestrial membership. The Family has been secretly involved in ruling both the Earth and other planets through highly placed elites in key social and political institutions. No one extraterrestrial race is the nexus of negative activities as mistakenly claimed by Icke and others. The nexus of evil (or negative polarity) comes from a Luciferian entity or group soul that has physically manifested itself in terms of an elite called “The Family.” Humanity and extraterrestrial civilizations have similar problems in dealing with “The Family” which has succeeded in attaining power to varying degrees in their respective societies, especially so as we witness the end of the Mayan Calendar around 2012. So, an alien breeding and infiltration scheme suggested. Extremes of corruption pursuant to some end goal. In any case, such corruption lessens the mind and reduces ANY and ALL conspirators to low order tools of what, if you look beneath the surface, would then be an alien materials and resource grab. Whether couched in terms of a philosophical rationale, no mind can possibly remain functionally intact, no mind can clear and be responsible as it should, via such corruption. And which aliens resemble this kind of strategy? Should be easy to infer.